This gives me some little pressure I must say, even if this is a situation I’ve already lived during summer and fall 1998.
as a side note: I’d recommend to any startup who plans to release a product for users to start a crowdfunding campaign: it forces them to make the project clearer, it establishes connexions within the ecosystem, it starts getting early adopters and future users onboard, and it can fuelsthe project on the financial side. associated web-services: email, cloud storage, and various online services, all that from open source software that we will repackage into a consistent environment that will be the default into eelo ROM and offer an intuitive experience to users. Plus an API layer for all those services so that eelo phones owners can install the eelo web services on their own servers and configure that into the ROM if they want. eelo is for mum and dad, and children etc. (and me! ), not for James Bond or people who have illegal activity. 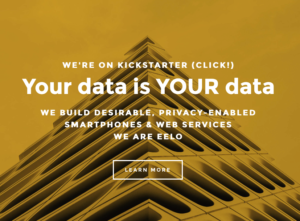 This means that eelo is going to put a lot of effort on privacy and security, but will not be meant to be something like “supersecurestealthphone” for instance. 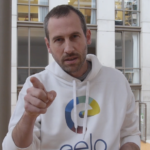 This also means that eelo will offer an application repository that will provide both open source mobile apps such as what is available on F-droid, and mainstream applications because yes, some people are still using whatsapp and instagram… and eelo is about freedom and education, not a totalitarian project. Some people have asked me if there was a way to do some simple donations to the project, so the answer is yes, Kickstarter can be used for that (without rewards) and it’s the preferred way, but there is also a donate page on the website (Paypal and Bitcoins). We can change the story of our digital lives, thank you for your support! Buddy, Happy Holiday, Merry Christmas and an happy new Year ! keep it up ! and hold it noncommercial, only small and stable with a huge community with many feedback and a good forum like mdk.. give feedback, if this stocks do you know to be something wrong, if the project to commercial, do you know too to be something very wrong…. so, letz rock Open Source.. yeeaaa ! I would recommend to have a look at the Fairphone project. Although this might will sound unrelated, a closer look at their forum will show how people (the company, moderators and members) struggle with the different concepts of roms, apps and services. It also shows how deeply “Google” controlled the whole Android process still is, even for people trying to play with LineageOS/f-droid and MicroG. I understand and fully support your James Bond metaphor (basically the old Signal discussion). But most services will need a quasi-central server to coordinate and work for your “mum and pop” clients. This will mean monthly fees if people don’t want to do the vampire way and make a living from selling the users data. A service that did this and works well is posteo. * Be more specific about your goals. Draft a plan/timeline. * Be transparent about costs, so when the time comes and you might will need money to keep the services running and the admins fed, make sure people will understand where the money will go. Fairphone did this for their phone partly(!) and made a bit fuss about it, but they were never really transparent about their whole business. * One developer is not enough (bug fixing, new features, stable releases) and you will need admins for the servers (plural) as well. Can you explain as an FAQ item how you plan to do this with 3 people. * Try to establish support, bug/feature reporting right form the start. Try to track as much as possible (costs, issues) and also make this transparent to your users. So they can understand what their freedom will cost them. I don’t think paying one-time will work at all. You need some kind of subscription model. If you get something up and running. * The day your start thinking about hiring a PR or a “community manager” for you project … make sure you don’t do it to cover the problems your project got. Just take about them openly. Hiring someone to share the workload and answering all the FAQs is fine. Hi, I was reading with great enthusiasm everything related to this new exciting adventure that you bring in hands Gaël, which I have no other thing to congratulate you. On the other hand I tell you that I am from Argentina, South America, where the penetration of mobile systems is quite high with the brands Samsung, LG, Motorola, etc. to the head. They are used even more than desktop computers, which makes Android the king in all its versions, but by no means free software leads in PCs. There virtually everything is MS Windows and the rest a small share of Mac OS and at most some GNU / Linux (more than anything Ubuntu distro). This proposal reminds me with a certain nostalgia for that promising launch called Firefox OS of the Mozilla Foundation, which failed miserably. Something that since I do not expect to happen with it. “eelo” it’s sounds good to me and I will support what I can with their development and I hope for more good news in the near future. Hello, thank you guys for all your insights. I have all that in mind, and we will try to address each question or concern the best as possible. Have been following this project with great interest. Apple is the only large vendor talking about privacy & they are only one CEO change from that going away – not a good bet long term for world privacy. I wish the best of luck. Have to ask that you please reconsider Telegram as default messenger client – it has serious security design issues – Wikipedia lists some (& while this isn’t a James Bond phone its messaging design should be difficult for bad governments to mess with – it’s client / server encryption model is bad for this & it’s closed source). Signal is end to end encrypted and open source I believe, but there are other options – Telegram isn’t a good foundation to build on. Thanks for working on this and considering my input, best of luck. (the other end to end encryption messaging platforms wouldn’t be doing this for Iran’s Govt – Signal in particular has added VPN functionality for users in countries where the govts don’t like it) Please reconsider using Telegram as the messaging platform – you can do much better – people’s lives may be on the line in the future. Thanks for your consideration on this topic. How about using Matrix as the messaging platform? It’s can bridge to various other networks (including Telegram I think) and that means “proprietary silo” chats lose some of their power over users. Purism’s Librem 5 will also be using it. Previous PostPrevious Leaving Apple and Google: my eelo odyssey. Bootstrap!